Britain’s beef industry has experienced a sea change in recent years. When yield was all, our native breeds didn’t stand a chance beside meaty monsters from the Continent, breeds such as Simmentals and Limousins that could be fattened and brought to the table in roughly 20 months. But in the past 10 years, the tide has changed. Consumers have woken up to the value of traditionally produced beef from our hardy natives, and breeds such as the Red Ruby Devon, the Red Poll and the British White have all marched back into the farming mainstream. There’s no denying that the Belties’ markings have a large part to play in their popularity; with their black, dun or red coats and white belts, they are striking and instantly recognisable. It’s thought they first emerged in the 17th and 18th centuries as a result of a cross with a Dutch belted cow called a Lakenvelder and a Galloway, an ancient breed from south-west Scotland. There were four foundation herds, all originating from what is now Dumfries & Galloway, and, in 1921, they combined with 13 more Scottish herds and nine English ones to form the Dun and Belted Cattle Breeders’ Association. The society formed a successful export market and there are now herds all over the world. With or without Mr Shearer’s help, the message about Belted Galloways is spreading because of the quality of their meat, as well as their low-input credentials. Yorkshire farmer Tim Wilson is an evangelist for Britain’s native breeds. He owns The Ginger Pig, a string of butcher’s shops across London. ‘I’m a British-breed person. I believe they have a better flavour,’ he says, with a Yorkshire-man’s confidence, and he isn’t alone, because in foodie Meccas such as Borough Market, customers, including singer Lily Allen, go wild for his home-reared Belted Galloways. He chose the breed for its hardiness and flavour. ‘We did a taste test between a Belted Galloway and a Beef Shorthorn and the Beltie came off better each time. The marbling and texture were wonderful and it was a lovely soft, brown colour.’ Among the restaurants he supplies is Hawksmoor, London’s top steak restaurant: ‘It has a tasting table where you can try different breeds; my Beltie beef is often there. There’s no escaping the fact that beef is better for growing longer.’ London’s leading restaurants are not the only places responding to the call for Beltie beef. In Cumbria, Jon and Caroline Watson are selling 60% of their Belted Galloway beef straight off the farm to restaurants in their area, and, to top it all, the cattle do a lot of their own marketing. ‘The farm is a popular spot for walkers and the cattle generate a lot of interest.’ This feeds into the Watsons’ business-they have an on-farm butchery and a website sending Belted Galloway beef throughout Britain (www.yewtree-farm.com). It’s a win-win situation for farmer and consumer because Belties are low-maintenance. 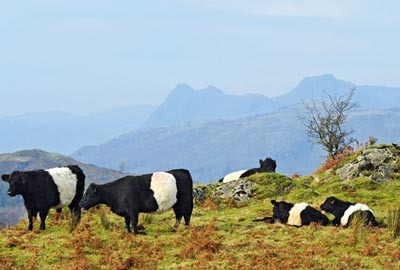 Although Belties have spread far and wide, the majority of Britain’s Belted Galloways can still be found in Dumfries & Galloway, and the Mochrum herd, based near Port William, is one of the oldest and most influential. Established in 1890 by the 5th Marquess of Bute, the herd was developed by his son Lord David Stuart, and carried on after his death by his daughter, Flora, who was also an authority on the breed. The herd currently consists of 100 breeding cows and the good work is continuing in the hands of Flora’s cousin, David Bertie. ‘We’re very keen to help people to get started,’ he says. And how delighted the Stuarts would be to know how popular Belties have become-watch out for a herd coming to a field near you.